While not initially a big commercial hit, American McGee’s Alice turned into something of a cult title in the years after its 2001 release. The game’s devoted following was mostly due to its eccentric art direction that put a dark spin on Lewis Carroll’s classic story of Alice and her adventures in Wonderland. Then again, since the book’s narrative was arguably quite surreal, maybe the game just emphasised these already existing, unsettling undercurrents. In any case, somebody thought a sequel to American McGee’s Alice would be a good idea. And so, a full ten years after the first game arrived, Alice: Madness Returns saw the light of day, hoping that sticking to its predecessor’s characteristic art direction would make it just as much a favourite as the first game. Only time will tell if that’s going to be the case. At least upon release, Alice: Madness Returns was met with a generally positive, if hardly outstanding, critical reception. Just like the game itself, the soundtrack for American McGee’s Alice has gathered a considerable number of admirers, due to ex-Nine Inch Nails member Chris Vrenna’s ability to write an unnerving score that perfectly mirrored the game’s sense of wicked wonder. Many hoped for Vrenna to return for Alice: Madness Returns, but ultimately, he would only contribute some input early in the project and one cue for the score’s album release. The bulk of the music was handled by Jason Tai, with some support from Marshal Crutcher. The latter would score the game’s London sequences, while Tai would create music for those stretchs of the game that were set in Wonderland. 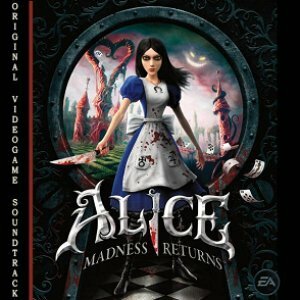 Given the pre-release anticipation, it was no surprise that Alice: Madness Returns‘ soundtrack was promoted via a special deal with GameStop, Amazon.com and the EA Store, whereby gamers who pre-ordered the title received a ten-track digital copy of the score. A more complete presentation of the soundtrack was made available later through a 21-track album sold as a digital download. Let’s cut to the chase: if you expect Alice: Madness Returns to revisit American McGee’s Alice‘s unique sound — or even create one of its own — you’re in for a disappointment. Rarely does Alice: Madness Returns display a similarly strong sense of character as the first game. While American McGee’s Alice was both inviting and disturbing, usually within the same composition, Alice: Madness Returns will most likely leave you cold with its nondescript soundscapes. Keeping in tune with Tai’s approach of looking “at audio as a whole, i.e. music, sound effects, and dialogue”, many of the cues on Alice: Madness Returns blur the boundaries between music and sound design through their ambient nature that relies on textures rather than melodies or rhythms. All fine and good, but if the result is as uninspiring as here, things get boring pretty quickly. While Tai in interviews highlighted the score’s “instrument palettes and the unique arrangements”, as well as the “dark, mysterious, quirky and surreal” nature of the music, it’s difficult to identify any of these qualities on this album. Too many of the pieces on Alice: Madness Returns are bland atmospheric interludes, often just a bit longer than a minute. The instrumentations never develop any particular atmosphere beyond a general feeling of eerieness, at best slight unease — certainly nothing as fascinatingly ambiguous as Vrenna’s score. The majority of Tai’s pieces share the same approach: wavering synth pads, rarely densely layered, fill the ether, while on several occasions, a tinkling melody lead is heard on glockenspiel, chimes or piano. Different to American McGee’s Alice, these motifs are given a hazy sound that makes them blend with the ambient surroundings. And due to the motifs’ simple and repetitive nature, they become just another layer of less than creative sound. They still have the capacity to become actively annoying though, unable to withstand the wearying effects of constant repetition on “Off With Her Head” and “Surreal”. The latter track hardly does sound surreal — like on many other tracks, there’s not much here that you haven’t heard before as atmospheric underscore on other horror soundtracks, only without the scary bits. With a track titled “The Asylum”, you’d expect to hear music that’s frightening on some level, but the cue’s 63 seconds will at best send you to a nightmare-free sleep. Other pieces like “Sunken Crypt” and “Jade” just wander by, slightly different in the textures they apply, but both never eliciting any particular effect and just quietly finishing after two minutes. It’s difficult to decide then if the short running time of most tracks — and of the album as a whole — is a good or bad thing. Longer pieces such as “Sunken Crypty” and “Surreal” fail to sustain themselves and very quickly start to meander aimlessly. On the other hand, shorter tracks, due to their usually less than spectacular nature, briefly pop up and disappear again without leaving much of an impression. Every once in a while though, Tai inserts some curious details in his compositions. It’s these occasions that hint at how this score could have been much more interesting if more such signs of creativity had appeared throughout the album and if they had been given a greater chance to dominate the music. “Queensland” and “Pulling Strings” fail on that latter account, but one is inclined to commend them just because they feel less phoned in than many other pieces. Neither composition is outstanding, but the unintelligible voices scattered across the soundstage on “Queensland” and the high-pitched motifs on “Pulling Strings” that flutter through the characteristically morose synth backdrop give both cues a modicum of character. Tai’s best composition is “Shadown Scroll”, which on the surface is another, chillier take on the “tinkling chime melody against ambient backdrop” formula. But then you realise after listening more closely that what sounds like an instrument riff in the background are actually children singing a cheerful melody, only that their voices have been manipulated almost beyond recognition into something much creepier. It’s a subtle effect, and all the more effective for it. The other more successful ambient composition comes from Vrenna, who shifts the music into a harsher, more industrial environment. Vrenna constantly finds new ways to manipulate what once were notes played by a string instrument and turns them into shrill sound effects that lurch at the listener and surround the cue’s electronic beats in layer upon tattered layer. The album’s saving grace is the main theme, courtesy of Marshall Crutcher, who provides most of the score’s highlights. The theme is first presented on solo violin on the appropriately titled opening track “Alice: Madness Returns Theme”. Sounding a lot like a tango melody, particularly with a strutting string rhythm supporting it, the theme sounds fittingly mysterious and alluring. As performed on this cue, the theme exudes a 19th century cabaret vibe that suits the game’s shadowy, sometimes bizarre world. On “Madness”, the theme returns on solo violin, but now that Alice has ventured deeper into Wonderland, the melody is surrounded by more disjointed, synthesised orchestrations. Layers of both sounds and music seem to come from all directions and put the theme in a context that meaningfully underscores Alice’s progression through the game’s story up to this point. Fortunately, Tai incorporates the theme into a number of his compositions as well. “Hyde Park” turns the theme into one of the many tinkling melody leads that here adorns a composition which at 43 seconds has no chance to go anywhere. More interesting is “Dollhouses”, where the theme is used as another one of those repetitive motifs that are supposed to carry a track. But Tai twists the theme into a quietly unsettling melody and behold, the theme is strong enough to just sustain the composition, asserting its superiority over similar melodic ideas on Alice: Madness Returns. Released on the same day as the score for The Witcher 2: Assassins of Kings, Alice: Madness Returns shares an unfortunate characteristic with that other sequel soundtrack: both fail to live up to their predecessors. Most of Alice: Madness Returns is atmospheric underscore droning away in the background, devoid of interesting textures and character. The score retains a constant, often generic feeling of ominousness and is probably sufficiently atmospheric for the purpose of accompanying the game’s action. But the music rarely leaves an impression when forced to stand on its own. When the soundtrack does make its mark, it’s either when Tai gets a bit more creative and shows himself capable of deploying subtle means to create dread, or when Marshall Crutcher’s alluring main theme appears. Then again, that theme doesn’t appear often enough throughout the soundtrack for its appeal to be put to full use. There are some highlights here and there, but for the majority of its running time, Alice: Madness Returns is a dull accompaniment for some of literature’s most colourful characters.